‘You look a little shy; let me introduce you to that leg of mutton,’ said the Red Queen. ‘Alice – Mutton; Mutton – Alice.’ The leg of mutton got up in the dish and made a little bow to Alice; and she returned the bow, not knowing whether to be frightened or amused. I recently read a piece in the Independent by Samuel Muston which suggested that mutton was making a bit of a comeback. This got me thinking: I’ve never actually eaten mutton, let alone cooked it. Even the word “mutton” sounds archaic and glottal; something from an age of crinolines and penny farthings. We are sophisticates, after all; we eat nice, soft, milky lamb. Two-year-old sheep went out with the ark, right? Mutton is said to have a more complexity of flavour than lamb, a more gamey quality. You can compare the difference in flavour between mutton and lamb to that of chicken and guinea fowl. But you’d be mistaken in thinking mutton is cheaper than lamb just because its older. Quite often you pay a premium as it’s harder to get hold of. More and more restaurants are now featuring mutton dishes on their menus. So if it’s good enough for them, it’s good enough for me. I decided there and then I was going to get hold of some of this “most British of foods”. While some Waitrose stores now apparently stock mutton, I couldn’t find any in my local supermarket. So I turned instead to my local butcher Jon Thorners who ordered some in for me: half a leg and some casserole meat. However, whilst many British consumers turned their back on mutton, it has remained highly valued in Asian, North African and Caribbean cuisine where long, slow marinades are combined with moist methods of cookery. A mutton curry therefore seemed to me the most obvious thing to start with. Our friend Mikey, who’s living the good life in Cephalonia making wine, had recently been raving about a recipe for goat curry. It sounded perfect. The verdict? Well, I can’t recommend this recipe highly enough. The meat was beautifully tender and the flavours both spicy and delicate. The meat needs to marinade overnight and it must cook for a few hours, so not a dish to rustle up quickly. But as they say, good things come to those who wait. In a bowl, add all the marinade ingredients to the diced mutton and mix well. Cover and keep in a cool place over night. 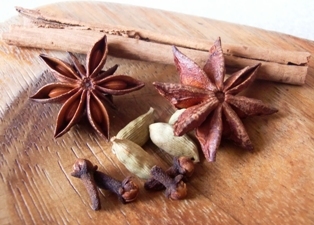 Heat the oil in a large pan, and then add the cloves, star anise, cinnamon stick, and cardamom pods. Cook the spices for a minute or so before adding the onion. Cook the onions with the spices for 10 minutes then add the mutton. Stir and cook for 10 minutes, then add the stock, tomatoes and tomato puree. Cover and simmer over a low heat for about two hours. This is a perfect Aga dish. I cooked it in the bottom of our Aga for four hours. When the meat is tender, add the potatoes and cook for another 20 minutes or so. Remove from the heat, check the seasoning and stir in the coriander just before dishing up. Serve with rice or naan bread. Or both. I’m salivating just thinking about it. This recipe looks amazing. I had a similar recipe earlier this week with marinated mutton. It really is worth trying and I’m glad you are helping spread the word. Nice post. I once asked my butcher for mutton and he managed to talk me out of it. I thought it’d be at least slightly cheaper. Found some mutton in my local butcher and searched for a suitable recipe. Don’t know why I chose this one but boy, am I glad I did. Nice’n’spicy but not too much, flavourful, tender meat and a thick, delicious gravy. Even better on the second day as usual. Thank you! Will certainly do this one again.